Some punk-rock snob will find reason to argue, but I like to think of Nikki Sixx as Johnny Thunders without the obituary. Certainly both are/were minimalist musicians, but their creative sense of style and swagger refashioned rock-n-roll like few others before or since. From the haywire hair, stacked heels and black eyes to the biker-style stage name, needle-poked arms and bathroom-stall death wishes, none were more notorious, reckless or dangerously alluring. I’ll come right out and say it: if Nikki Sixx died after “Shout at the Devil,” his mug would rival that of Sid Vicious for T-shirt sales. Fortunately, the anarchy fueled some great Motley music. 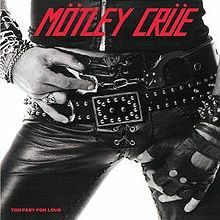 The aforementioned “Shout” would, of course, be the breakthrough with all its lipstick-n-leather Satanic majesty, but it was 1982’s Jack-and-coke fueled “Too Fast for Love” that spat Motley into the face of Duran Duran Speedwagon with all the defiance of a diseased loogie. Low-budget, drunk, painfully distorted and shrieking like a police siren, “Too Fast for Love” is perhaps the greatest fishnet-tangled metal/punk/garage/glam cowbell-fueled Molotov to ever destroy a turntable. For these two albums (and Nikki’s haircut, of course), I am forever indebted. I also appreciate the fact that Sixx is always a great interview. How could he not be? In the world of Sixx, even a trip to the grocery store could take a violent detour into drugs, strippers, tattoos and switchblades (or at least it could in the past now that sobriety somehow took hold). Even better, Nikki will spare you no gory detail if you dare to ask. 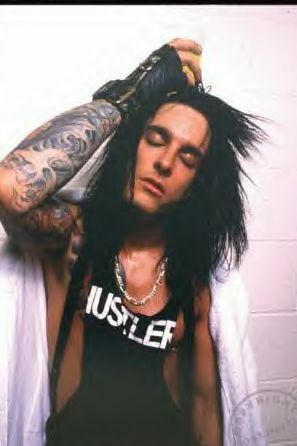 Ladies and gents on his 52nd birthday today (Dec. 11), I give you then-38-year-old Nikki Sixx (aka A. Hole) on Motley Crue’s 1997 “Generation Swine” tour. Heroin addiction was my downfall. There were overdoses, seizures, collapsed veins. I embraced everything everyone else was afraid of. Looking back, I have no regrets. I’m always gonna be an outlaw or a rebel, but now it’s based more on pride and doing the right things. It’s a heartbreak more than anything. Here’s a guy who was sleeping on a futon, then made hundreds and hundreds of thousands of dollars and blew it. We said, ‘Dude, we’ve been doing this for 17 years; you gotta slow down and save your money.’ The sad part is I think he turned a lot of Motley Crue fans against him. Those bands attached themselves to us and we weren’t necessarily happy about it. We’re not about an era, we’re about an evolution. There’s a lot of bands from that era, like U2 or Metallica, that don’t get called ’80s bands. Ozzy gave us our shot. There were some wild, sleepless nights and destroyed hotel rooms. In Orlando, these Bible thumpers asked me if I believed in the devil and I said yes. Then they run off calling me a Satanist! I never said I was a Satanist. I said I believed in the devil. I was never afraid of dying. I wanted to die. The problem was my (absent) parents There’s nothing that’s ever going to replace not having a father. As you get older and angry, you don’t know how to cope. You need tools to get solutions and I didn’t have the tools to cope. Anarchy is still something I embrace, but my children are so important to me. I’m very fortunate. I died, I survived and I’m still playing rock’n’roll with a sneer. Below: Motley Crue performing at the US Festival in 1983. “Shout at the Devil” had not yet been released, meaning the boys are fresh outta the clubs and soon to take over the world. Killer stuff Dave, I remember you played me this interview at your rockin house! My first trip to Austin back in 2001, who do i see at Austin Convention Center but Nikki Sixx!! He was great with me going on about the 1991 Donington Monsters of Rock Festival etc.. This killer as alway’s!! Good stuff. 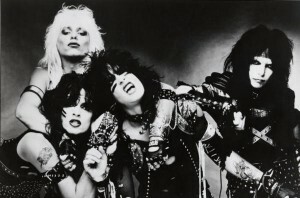 I love the first 2 Crue albums as well and it’s hard to believe how “early” those were. They really were forerunners. 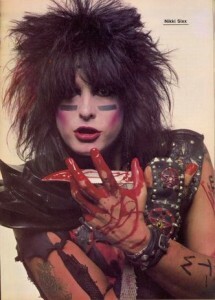 Nikki is and always will be Crue. He has basically written and played most of the stuff for ages. I have a lot of respect for the guy and glad he didn’t allow himself to go the way of a VH-1 diva like Michaels or even Tommy Lee who never shys away from TV opportunities.